Thank you for visiting my web site. I will be enlarging it and improving it as time goes on. You can find information about my gigs, music, reviews, and poetry, and listen to samples of my tunes and poetry, here, and you can buy all my recordings from CD Baby. Larry Englund of KFAI Radio in Minneapolis - St. Paul did a great interview with me. You can read it here. My new CD, the fourth in my Dedication series is here. Family Dedications and More contains works inspired by my mother, father, and brother, plus compositions for tenor saxophonist Houston Person, Brazilian composer Antonio Carlos Jobim, and the great drummer Elvin Jones of the classic John Coltrane Quartet. The musicians are Eddie Henderson, Wycliffe Gordon, Bruce Williams, Patience Higgins, Renee Rosnes, Steve Kroon, Peter Washington, and me. You can buy it from CDBaby. My book of poems, I'm Just the Drummer in the Band, is now available as an e-book!! You can buy it from Kindle, from Barnes & Noble, from Apple's iBookstore; from Kobo, from Sony, from Scribd. Over the next several weeks, it will become available for other e-readers. You can sample some of my poetry on the Poetry tab on this web site. My new CD, Personal Dedications & Percussive Tributes, is here! This is the third in my dedication series for people, places, and moods. Most of my music is autobiographical on some level, some more obvious than others. The compositions on the two earlier CDs in this series, Double Dedication and More Dedications helped me combine the traditions of jazz legends with my own concept of their style, as does "Something about Rollins" on this recording. The CD features Randy Brecker, steve Wilson, Wycliffe Gordon, Patience Higgins, Renee Rosnes, Steve Kroon, Peter Washington, and me. A two-disc set, it is essentially Volume II and (or) the extension of my previous CD, Double Dedication. Disc 1 includes my original compositions written for nine more famous jazz masters who inspired me, including Miles Davis, Milt Jackson, Joe Henderson, and Bobby Hutcherson. 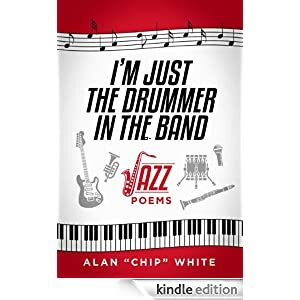 On, the second, shorter disc, I read poems from my book of poems for famous jazz musicians, I'm Just the Drummer in the Band, for each of the nine musicians, in the same order as the compositions on the first disc, with the music sequenced underneath. The musicians are Mulgrew Miller, Steve Nelson, Wycliffe Gordon, Peter Washington, Duane Eubanks, Patience Higgins, and me. You can listen to clips from my recordings, including my earlier CDs, Double Dedication, Music and Lyrics and Harlem Sunset, read some of the poems from my book, I'm Just the Drummer in the Band, see a list of my upcoming engagements, and learn more about me. I produced More Dedications, Double Dedication, and Music and Lyrics, as well as writing the music, lyrics, arrangements, and poetry and performing on them, and I am available as a producer for other artists who like my style. I also write lyrics for other people's music, and have been working with Don Sickler at Second Floor Music on some of his projects. I can collaborate with other artists on their lyrics. My band is available for all forms of jazz engagements, from club gigs and concerts to private events, and I specialize in jazz for the jazz lover. I am also available for music and percussion workshops. I hope you enjoy the music!